n Round QE1 2007-2009 of the unfolding global financial crisis, Federal Reserve Chairman Bernanke fought a remarkable round. It was the global financial and economic heavyweight fight of his life. Bernanke’s effort temporarily prevented a global deflationary debt and economic demand collapse in the unfolding Kondratieff winter season. It remains to be seen whether QE1 and the trillions it will cost U.S. taxpayers will change the ultimate outcome. The fight is still very much on, with the opponents briefly taking a breather in their respective corners. The bell is now ringing. Round QE2 has begun. Even those who object to the role of central banking and fiat money based on various views of monetary theory have to be impressed with the fact that Bernanke, at the very minimum, managed a draw in Round QE1. Kondratieff had delivered a crushing blow with a 50% plus collapse in real estate in many U.S. and international markets. Bernanke was too confident, fresh out of his ivory tower, and did not see the blow coming. The global banking and financial system, built on inflated mortgage debt, was sent reeling under the blow, no doubt seeing stars. Most thought the global financial system was going down for the count, but Bernanke, armed with almost $2 trillion dollars of monetary stimulus, backed up by fiscal stimulus, and aided by the natural bounce of a business cycle inventory rebuild, created the illusion that the global financial system had stabilized. Bernanke found his footing and was back in the fight. The problem is that Bernanke may not fully understand the deft, resilient and dynamic opponent he is up against in this global conflict. At least he is not letting on to his understanding of the Kondratieff long wave forces at work. Of course, it is heresy for Keynesian economists to recognize the genius of the Russian economist Kondratieff, since Kondratieff recognized the self-rejuvenating forces at work in the capitalist system, independent of central bank monetary and government fiscal stimulus. Most economists and analysts only believe that Bernanke is fighting a tougher than normal business cycle. What Bernanke and the rest of the central bankers and investors of the world need to understand is that this is not just a regular cyclical downturn; it is a secular Kondratieff long wave winter season, i.e., a debt bust depression. Few understand the remarkable and powerful force of the Kondratieff long wave boom and bust cycle. 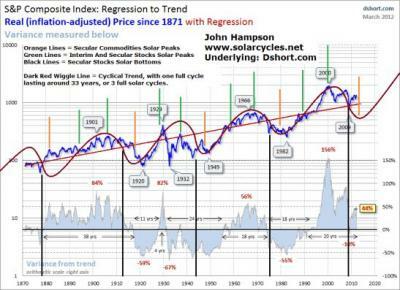 It is a great global cycle marked by distinct periods of inflationary expansion and deflationary contraction. The Kondratieff wave is also a great cycle of innovation and change in communications and transportation technology that drives the long wave advance. The Kondratieff long wave changes everything. It creates entirely new business paradigms to drive the next cycle of international free market capitalism. Central bankers enter the ring with Kondratieff at their peril. The Kondratieff long wave cannot be managed with monetary and fiscal policy. The long wave is a force primarily driven by the creative power unleashed by free markets, with the fuel of human capital that thrives on freedom, liberty and self-made opportunity. The powerful force of human action drives the long wave, and not government confiscation and redistribution of wealth, intervention and artificial stimulus applied to bad ideas. The Kondratieff wave is a force of nature, wrought by the powerful and dynamic forces of the human spirit in action. Inspired human action makes international free market capitalism the greatest force ever unleashed in the world. If you stifle the human spirit, or force it to pay for the mistakes of others, you inflict deep damage on the system and slow down the natural long wave rejuvenating process. However, even when the Kondratieff long wave is hobbled and muted by political pandering, plundering and interventionism, it will still have its way with the global economy. Investors should know that Kondratieff has never lost a fight with a banker. 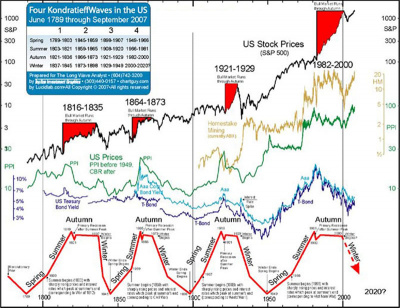 Kondratieff is 4-0 since 1789 and going for 5-0 as this long wave winter fight stretches into 2012. Odds are Kondratieff will continue to give the global economy and financial markets a drubbing in the next few years that will be remembered for generations to come. Then the long wave will make its turn from winter to spring, and unleash a global boom of heretofore-unimaginable economic growth and human achievement. In addition to QE1, dropping interest rates isn’t producing the juice that Bernanke and others hopped it would. 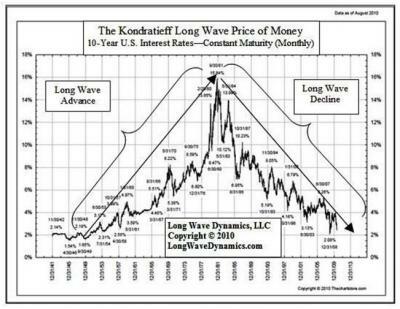 The fact is rates have been headed down for a long time, since the Kondratieff long wave peaked in the early 1980s. The chart below demonstrates that Kondratieff has been delivering a steady and consistent disinflationary and sometimes deflationary licking to the global economy for years. Interest rates are the price of money. This brings up the issue of whether central banks really control long-term interest rates at all. They can adjust short-term rates. However, they cannot really control long-term rates. Interest rates have been trending down since their peak in 1981. Does the chart of the 10-Year U.S. Treasury below look like the central banks of the world are really behind the wheel? The long wave pattern is clear. Russian economist Kondratieff has had the wheel of the global economy all along. The central banks of the world are just going along for the ride, distorting short-term rates, dropping them to artificially low levels, and creating business cycle distortions of excess consumption and supply. Central bank rate manipulation only makes the regular business cycles longer and more harmful than they have to be to capital formation. Businesses cannot get a clear picture of demand due to artificial stimulus and overconsumption. Central bank loose money, coupled with government fiscal stimulus has created massive oversupply in the global economy. You name it; houses, cars, refrigerators, HDTVs, and the list could go on. Massive oversupply is swamping the world with overcapacity, driving down prices and triggering protectionism and the currency-trade wars erupting around the globe. The Kondratieff long wave has been telling the world for a long time that it doesn’t need any more money for expansion, and that there is ample supply of everything the world needs for the normal economic forces of demand. Politicians always want to interfere and create demand from non-economically viable parties like Fannie Mae and Freddie Mac, so they can donate to the politician’s coffers for the next election, but that game is ending. Fiscal stimulus is always throwing the system out of balance and Bernanke and his predecessors are called in to juice the system with monetary stimulus and create demand for various supply boondoggles. The Federal Reserve’s low interest rates policies have been staying one-step ahead of the natural decline in the demand for money. Global equity markets rallied in September in part on the belief that QE2 will counter the Kondratieff long wave deflationary forces at work, and not just in the U.S. but globally. There is widespread conviction that QE2, plus QE Lite (mortgage payments to the Fed recycled into more government debt), will halt the deflationary trends. Unfortunately, there is north of $30 trillion in public and private debt in the U.S. economy. If you add unfunded liabilities, you can get over $50 trillion of dollar denominated debt in a hurry. In light of the amount of total debt that is exerting a deflationary drain on demand and asset prices, the long wave deflation forces that are already in play will just soak up another few trillion in QE. Deflation destroys corporate profits. 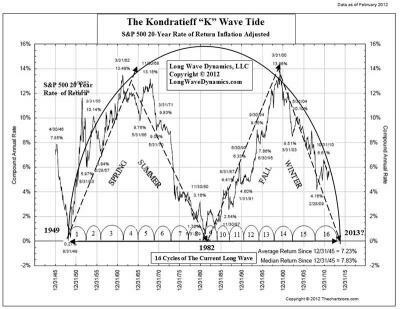 The chart below is the Kondratieff long wave map for equity returns that points to collapsing global equities into 2012. 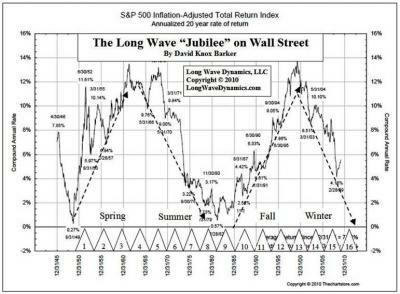 The final business cycle of this long wave appears to have topped, and will descend along with the long wave collapse in demand and its accompanying deflation. Bernanke’s impressive efforts in Round QE1 have given the world time to contemplate the depth of the abyss, and for you to get your financial house in order. Bernanke and Kondratieff have now both wiped the sweat off their brows and prepared the plan for the next round. That fateful next round, now known as QE2 is now upon us. It is not just in the U.S. but the entire global economy. 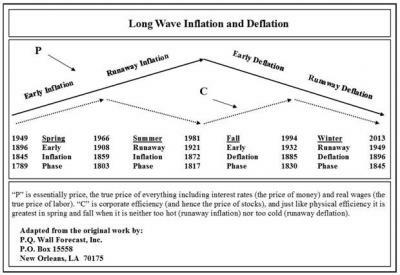 The history and evidence for the Kondratieff long wave suggests Kondratieff and deflation have the upper hand for Round QE2. If Bernanke gets in a few sucker punches by buying up Zimbabwean sewer bounds, or even a few billions in California, Nevada and Florida municipal bonds, maybe he will teach Kondratieff a thing or two this round, but then Ron Paul will have more than the votes he needs to start the audit the Fed. Politics are in play. If the Fed goes down the QE2 trail with anywhere close to the $3 trillion number being floated in the rumor mill, the call for an audit of the Fed will gain support, and the independence of the Fed will be in serious doubt. Bernanke is a smart man; he sees the global wave of fiscally conservative politics that is building in the U.S., which will require a more conservative and less proactive Federal Reserve System. As the global economy slides into the Kondratieff long wave deflation, Bernanke may realize that the political forces in play require the rope-a-dope, as Germany has already signaled. The smart central bankers in the world have realized they need to let the global economy take the natural dose of long wave deflation and debt liquidation body blows that it has coming. 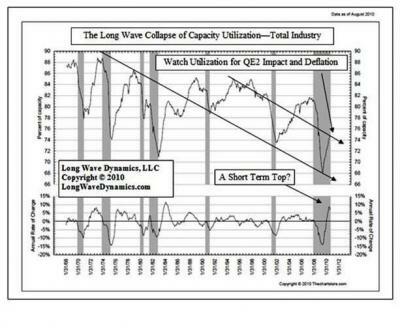 Once the inevitable long wave debt liquidations are shaken off, a new long wave expansion will begin. Bernanke and the Federal Reserve Board recognize that Germany is now the responsible designated driver of the central banks. Germany has begun the required shift toward austerity to get this long wave winter season behind the European economy and in turn the global economy. In the end, the Fed will not want Germany and the ECB to take the lead in global monetary affairs. Blowing up the monetary system is simply not an option for the Fed, which is what unlimited QE2 would achieve. QE2 will result in escalation of the global currency-trade war. Global currency-trade wars, currently on the rise, could wreak havoc on the global economy. Inflating the dollar is a beggar-thy-neighbor policy that is exporting U.S. deflation to our trading partners, and they are growing tired of it. U.S. trading partners have been pushed to the limit. Our trading partners will devalue their own currencies to defend against a cheap dollar that is exporting U.S. deflation to the world, triggering a vicious currency-trade war cycle. Germany appears to be the exception that has made the decision not to inflate and take the Keynesian low road. They will reap rewards in the end. Keynes was wrong; it is in the short run that we are dead. In the long run international free market capitalism will be fine, if the world follows Germany’s lead. Bernanke was impressive in Round 1, but he is the newcomer. He has an arsenal of monetary weapons, but Kondratieff has history on his side, and the largest amount of overcapacity funded with deflationary producing debt. It is not the popular position, but Kondratieff long wave deflation remains my pick for the outcome of Round QE2. Watch the CPI, PPI and capacity utilization, which will tell us if Bernanke and QE2 can stop the global long wave deflation that is on the march. Here in late 2010, as Round QE2 gets underway, all the theories of inflation vs. deflation are on the table. Theory now becomes theater, and all the world is the stage. member Bernanke’s impressive efforts in Round QE1 have given the world time to contemplate the depth of the abyss, and for you to get your financial house in order. Bernanke and Kondratieff have now both wiped the sweat off their brows and prepared the plan for the next round. That fateful next round, now known as QE2 is now upon us. It is not just in the U.S. but the entire global economy. 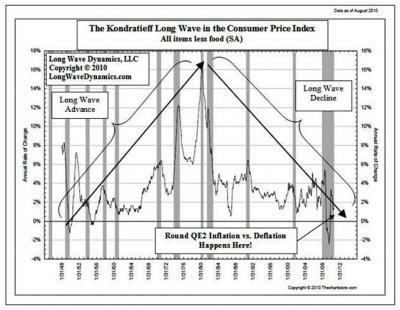 The history and evidence for the Kondratieff long wave suggests Kondratieff and deflation have the upper hand for Round QE2. Prices will rise and the dollar crash if Bernanke’s QE2 and inflation are winning and rates will be driven lower. If Kondratieff is gaining the upper hand in Round QE2, CPI and PPI prices will fall, the long bond and 10-Year will continue to rally in price, and interest rates will fall naturally into the upcoming long wave trough in 2012 before trending higher. If Kondratieff long wave deflation dominates this round, the dollar will not collapse, it will rally hard into 2012. Gold will likely rally either way, as it is increasingly recognized as the world’s most legitimate reserve currency. Central banks have stopped their gold sales, preparing for the meteoric rise of digital gold currency as the global currency that will ride herd over the rest of the world’s currencies, and punish the currencies whose governments do not embrace the new fiscal conservatism. In the end, Bernanke will do the right thing. He is too smart to not recognize the long wave forces at work, even if he cannot acknowledge them publicly. He will concede the fight to Kondratieff, in the interest of the U.S. and global economy. The new political wave of fiscal conservatism and austerity that is coming to Washington and around the world will demand it. Bernanke will ultimately defend the dollar. In our book, Jubilee on Wall Street, An Optimistic Look at the Global Financial Crash, Kondratieff is the odds on favorite in Round QE2, but Chairman Bernanke will not throw in the towel without a fight to remember. Place your bets, buy some gold, take a seat if you are up front, and pass the popcorn.